BAGHDAD, April 15 — Like the soulful drumbeat of a funeral procession, hundreds of Shiite Muslim men swung their arms to heaven and crashed their fists down on their chests. At once mournful and cathartic, the cadence echoed today off the white marble floors and ornate turquoise tiles of the holy shrine of Kadhimiya. In a ritual banned since the 1970s, the men chanted the names of their saints, an act of worship that recalled the tens of thousands of Shiites dead, detained, tortured or exiled under three decades of Baath Party rule. 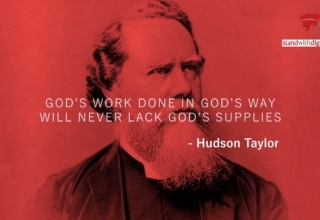 “By God, we will not forget you”, they intoned. In the tumultuous days of Baghdad’s new beginning, the country’s emboldened Shite Muslim majority has embraced its freedom with an explosion of public ritual unseen by many in their lifetimes. In its ardor, the revival has captured a moment that speaks to the jubilation, unease and gathering forces of a country in the throes of transition. Across the capital, black scrawls of graffiti honor Imam Husain, the grandson of the Prophet Muhammad killed in a battle in 680 (Hijra Calendar) that is a defining moment of the Shite faith. Young and old in the Kadhimiya district, the spiritual center for Baghdad’s Shiites, have flooded the streets in marches that began hours after the government fell. In a sign of empowerment, a fire truck seized from the government roams the battered streets — horn honking, lights flashing. “This vehicle belongs to the Kadhimiya shrine,” declares some writing on the truck’s side. The scenes have unsettled some in Baghdad, home to a Sunni Muslim elite that once ruled the country, Kurds who look to their homeland in the north and Shiites who, in increasingly bold terms, speak of claiming their rights as the majority. 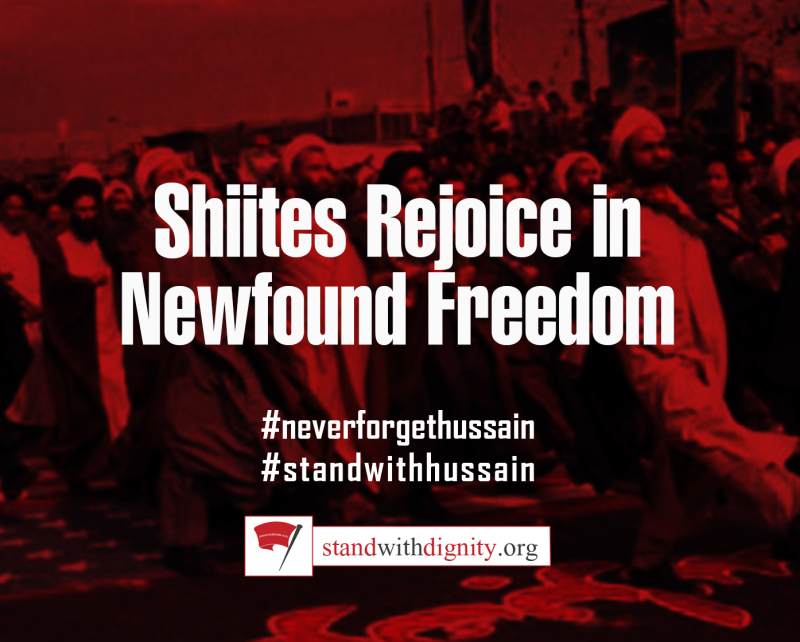 Others call the outpouring an understandable response to years of repression under the deposed president Saddam Husain, when Shiite rites were banned and the faithful were suspected of secret loyalty to the Shiite leaders of neighboring Iran. For those surging through the streets of Kadhimiya today, it was a time to celebrate their freedom and venerate their martyrs. The division between Shiites and Sunnis dates to a 7th-century dispute over the succession of the Prophet Muhammad. Shiites believe his son-in-law, Ali, should have followed him as caliph, Islam’s supreme leader. 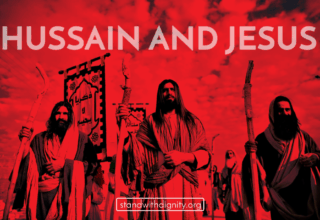 That conflict was followed by the central event of Shiite spirituality—the death of Ali’s son, Husain, and his outnumbered party in a battle at the city of Karbala. The memory of his martyrdom and the powerful emotions it evokes are comparable to the sentiments inspired by the crucifixion of Jesus. “All the land is Karbala”, read one banner in black today. In the afternoon, crowds of men poured out of the shrine, its four minarets newly draped in black banners. They waved swords and carried black flags that read. 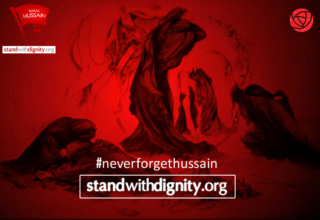 “Oh Husain.” Some men beat their chests and slapped their foreheads. Others held the Qur’an aloft. Along a street soaked in sewage and strewn with trash, residents looked on with a mix of devotion and awe—grief over the ceremony of remembrance and jubilation that it was happening. Some beat their chests to the rhythm of the instruments. Others looked on solemnly. “We’ve been waiting for this moment for a long time,” said Sayyid Mohammed Sayyid, who was clad in black. A friend standing next to him, 25-year-old Ali Abbas, cast the emotions in more recent terms. “We’re celebrating the fall of Saddam Husain,” he said. During his rule, public gatherings like todays were banned, by force of law or suggestion. Shiites no longer risked walking barefoot in pilgrimage of Karbala. 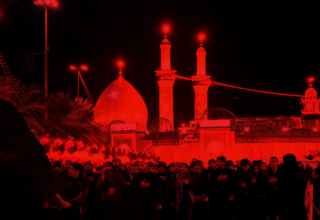 Listening to tapes describing Imam Husain’s martyrdom could bring a prison sentence. Saddam Husain’s portraits have now come down in Kadhimiya, replaced by religious icons. Portraits of a leading Shiite cleric, Grand Ayatollah Mohammed Sadiq Sadr, who was assassinated in 1999, grace the shrine. Black, green, white and red flags, once a sign of subversion, flutter from the mosque’s walls. Nine of the mosque’s custodians fled because they were too closely identified with the government. Members of prominent families who kept their distance from the Baath Party have replaced them. Within days, the governmental dictates that had hung at the mosque’s entrance were torn down in favor of the commands of the clergy in the holy city of Najaf, the burial place of Ali. “The honored clergy of Najaf forbid stealing property of the state that belongs to the people,” one sign says. Another forbids women to enter the shrine if they are wearing makeup and are not veiled. The procession was infused with the sense of a new order, with voice tumbling over one another. Some spoke of revenge. The Americans must bring Husain to Iraq for trial, said Mohammed Abdel-Amin, “so that we can punish him.” Others apologized for shouting at a visitor. “I can’t stop. I’m happy! I’m happy!” said Azz Din Hasan, his voice still loud. Others brought out what they always thought would remain hidden. As the procession pushed along the narrow walls of a nearby alley, Ali Aidan showed off his ceremonial silver sword, a red and gold strap adorned with a red tassel. Made by his uncle, Aboud Jawhari, the sword was last carried by Aidan in 1975, he said. Since then, it had been in a wooden box, gathering dust in the cellar of his house. Across Baghdad, there remains an unease over Iraq’s future. Sunni Muslims worry about losing the privileged position they have enjoyed since the Ottoman Empire. Christians worry that their relative freedom under the Baath Party will subsumed in a wave of religious intolerance like that of the Iranian revolution. Shiite leaders seem aware of the anxiety, taking pains to offer assurances that they will respect minorities. Many insist that no real differences divide Shiites and Sunnis. But in the fervor of today’s procession, some made clear their ambitions. Shiites are perhaps two-thirds of the country, one man said. When asked whether the next government would be Shiite, 60-year-old Qassem Abdel-Husain smiled. Over two hours, the procession marched through Kadhimiya’s streets. The faithful aloft portraits of Imam Ali and Imam Husain. Cups of sweet tea were offered to visitors. Some people waved copies of the forked sword of Ali, known as Dhu al-Fiqar. The group soon returned to the shrine, where young boys sold the green flags of Ali for a few cents and vendors offered Dahina, a pastry of flour and sugar sprinkled with coconut. Many made their way to the mosque’s entrance, kissing the brass handles of the door or sliding their hands along its wood, a gesture to bring blessing, inside, and families sat contentedly on blankets spread across the floor. The banners were still flying. A green flag read, “The time of Husain,” their Husain. 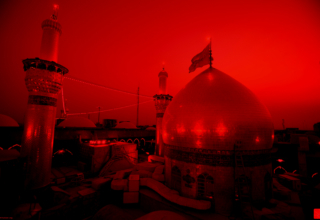 One said, “The light of my eyes is Husain”. Others read, “Husain is thirsty”, reference to the eight days that he and his party were surrounded and cut off from water. Weakened by thirst, he mounted his horse and rode into battle. A massacre followed. 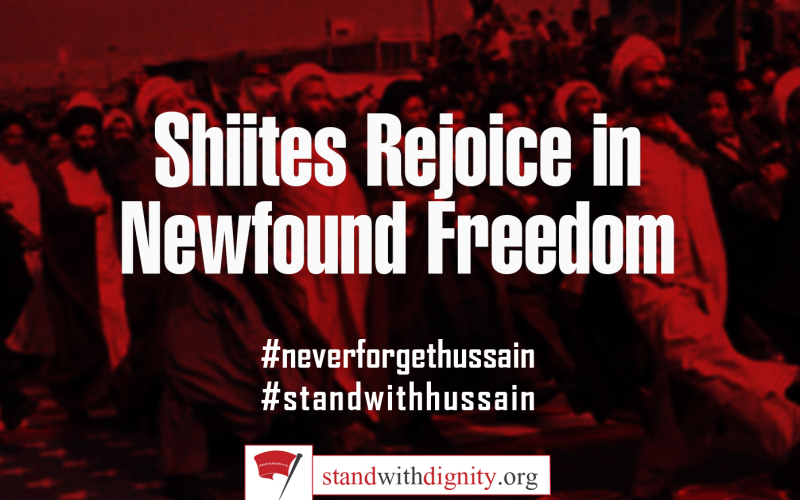 “We will not forget Husain, the beloved of God.” The crowd chanted. “I’ve never seen anything like this,” said Hassan Zuheir, 23, as he watched the ceremony. All his life, he said, his family had gathered with dozens of others in private homes to mark their religious holidays. Now they were standing on the marble floor, their faces blank with amazement. Some joined in. Others sat and stared. Mixed throughout the crowd were fathers holding babies or standing next to their children, gazing at the ceremony for the first time.